Which do you agree with most? is basically neutral or somewhat beneficial to society. is generally beneficial, or would be if the right people were in power. should be communal, with little or no private property. should be owned by workers or worker associations. should generally be privately owned (with exceptions), by any person or group. should in principle be privately owned, by any person or group. Now use your "score" to find your ideology. E.g. 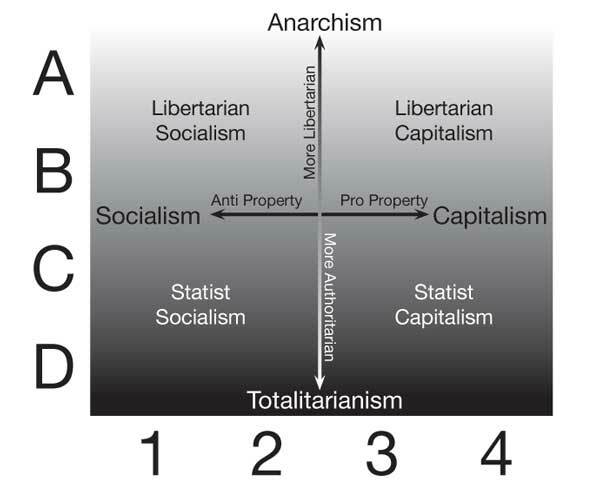 A1 is hard libertarian socialist; C3 is moderate statist capitalist. For more explanation and plots see the Ideology Map page.